*** This tire is sold out in most sizes. It has been replaced with the RT-615K. For those of you who are left with two good RT-615's and don't want to buy a full set of 615K's... Try running your left-over 615's in the front and the 615K's in the rear. Motorsports grade cap compound maintains grip over a wide range of operating temperatures. Increased internal void ratio delivers enhanced wet grip and aquaplane resistance under competition conditions. 8/32nd molded tread depth reduces "squirm" when new while providing predictable mileage for street use. 200AA UTQG qualifies for SCCA Street Tire Class competition. Fantastic tire for treadwear limited Auto-x and HPDE events. Only drawback is that once they get good and hot they tend to get a little "greasy" and lose a bit. Other than that, highly recommended, helped my Z06 to a great race season! Really good tires but dry traction is not that great. Style of tire is really good, love the look gets alot of head turners. I am totally please with the Falkin Azenis RT-615, on the track, city roads and hiway, it looks great, wears great, and handles corners very well! I only wish the price of them come down so I can put them on all my (6) vehicles!? Great tires. Quiet, especially for a Falken. These tires are for Auto-X, they're not DR's. Great wet and dry traction. Excellent handling. Looks and feels great but wish I would had purchased the 325 or 335 tires as these starts to break loose @ high RPM. bang for buck this is the real deal, can't get any better. The tires are not bad for day to day use. But when pushed hard, and you get on the throttle at the apex, the tire breaks lose very easy. To easy actually. Great tire for the price I paid. Unbeatable at this price point. Easily the worst 'high performance' tire I've ever used. Not even worth the $59/tire I paid on closeout. They're downright dangerous in the rain as well. I am very impressed with these tires, the grip is amazing, but with any high performance tire the life was very short lived. They were bald in 3 months. But those 3 months were awesome. I have not yet had the opportunity to try these on track on my Miata. The car is a daily driver that will hopefully see some limited track day use. The tires seem like they will be a great compromise, but have not seen hard cornering yet. Wouldn't buy anything else! Falken really got this tire right! These's tires offer the traction and stability they advertise! Great tire, but has been bested by other brands in recent years. great tire overall, will definitly purchase again, and also have recommended to others. Excellent tires for what you pay. The treadwear is of course greatly deminished over a normal street tire, but this is not a normal street tire, it's softer compound actually wears better than I expected and it holds up to changes in weather and heat rather well. Expect to rotate them often to keep tread wear even and to get the most out of your tires. 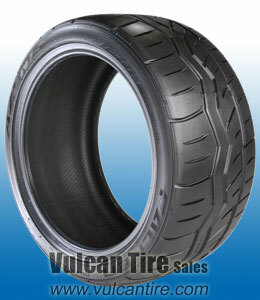 Can't wait to try the 615k's next, and I'll only buy from vulcantire.com! Track hours were hard to estimate. They have approx. 600 laps on them and they hardly show any wear, I have won 14 out of 15 races and 14 out of 15 heat races. The track is 3/8 mile asphalt with 12 degree corners and 6 degree straight away. Great tires to bad they stopped making them. Big differnce in price for the RT 615K. the tires were good all the way around except for the tread wear! it was horrible, they lasted me approx 5000 miles on daily driving and some aggresive driving! cant afford to own these tires again only buy if you dont care to buy new tires right away! I think these are a great all around tire for a great price. Mad grip, predictable and quite. The Falken AZENIS RT-615 could benefit from a larger selection of sizes. If they fit your application they're killer.